How can you, as an organization, design your own disruptive market possibilities? “Doing the blockchain” might get you there. 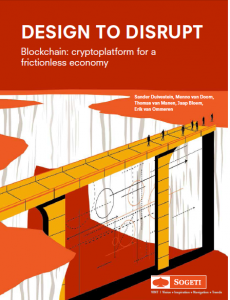 Read our new report Blockchain: cryptoplatform for a frictionless economy. “Disruption is the New Normal.” This is the key message from the series of our reports on the “Design to Disrupt” project. We have outlined the exponential growth of digital opportunities. Start-ups are keen to fill the gap, challenging the establishment. Their allegedly inferior propositions confuse prominent players, who should in fact be the very first to be open to disruptive innovation. This innovator’s dilemma brings us back to the major question of this Design to Disrupt project: how to design disruption yourself? This third report, that’s been launched today, is devoted to an entirely new design principle. It outlines the potential impact of blockchain, a new way of organizing trust in the presence of unreliable parties. It owes its current fame to the currency, the bitcoin, in particular, but the cryptographic capacities of the network can be deployed in a variety of other ways. It is a special kind of platform, which in its turn is a basis for numerous other platforms − in other words, a platform for platforms. We outline its relevance for organizations in three steps: the crypto-economy 1.0, 2.0 and 3.0.